Crunch time has arrived for the Bison men’s hockey team. 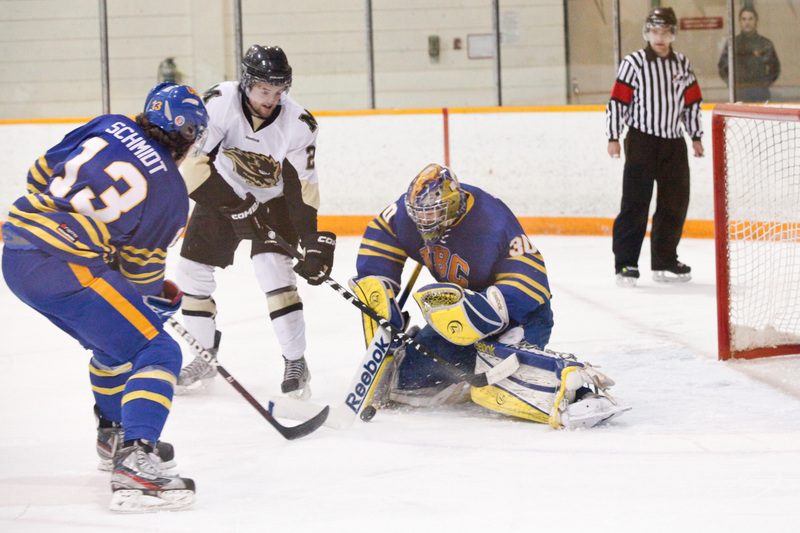 This past weekend the Bisons entered their second-to-last Canada West regular season back-to-back set with a narrow one-point lead over the Saskatchewan Huskies for second place. Holding the spot at season’s end would give the Bisons a bye into the second round of playoffs, a much desired position over battling it out in the first round. To hold on to that spot, the Bisons needed maximum points against UBC and the following weekend against Regina, or hope for a slip up by the Huskies. Tying with Saskatchewan would not get the job done, as the Huskies hold the season tie-breaker over Manitoba. Coach Mike Sirant offered up his take on the Bisons finishing in second. Friday night saw the Bisons get on the board first off the stick of fourth year player Luke Cain. The Thunderbirds would respond before the period was out as UBC captain Justin McCrae made it a 1-1 scoreline after 20 minutes. The Bisons yet again grabbed the lead as James Henry scored just 2:03 into the second. But UBC responded with a goal of their own, and later grabbed their first lead of the game. The Thunderbirds took a 3-2 lead into the third period. The Bisons turned it on in the third period, really looking to tie the game up. They outshot UBC 11-6 in the period but, despite a couple of power play opportunities, were unable to solve UBC goalie Jordan White and the Thunderbirds held on for a 3-2 win. Luckily for the Bisons, they got some help in the standings on Friday night, as Saskatchewan also lost to the visiting Calgary Dinos, so they were still in second heading into Saturday’s action. Prior to the puck drop on Saturday night, the Bisons honoured their outgoing members playing in their final regular season home game for the herd. Del Cowan, Jesse Deckert, Tyler Dittmer, Tyler Feakes, and Matthew Lowry were all honoured for their services with the Bisons during their CIS athletic careers. The Thunderbirds took the lead in the first after a scramble in front led to a Cole Wilson goal. The Bisons found themselves in the penalty box three times in the period, which prevented them from setting up in UBC’s end. A late UBC penalty provided the opportunity to start the second period on a positive note. The Bisons capitalized on the penalty, as Matthew Lowry scored just 58 seconds into the period. The score remained tied for some time, despite the Bisons defending a 5-on-3 penalty kill for 1:11. Special teams were a strength on the day for the Bisons, as the penalty-killing unit would kill all seven Thunderbird power plays. Blair Macaulay scored the second Bisons power play goal of the game with 2:58 to play in the second, and the Bisons added a quick insurance goal less than a minute later, as captain Dane Crowley blasted one through a screen to extend the Bisons’ lead to 3-1. Tyler Dittmer put the icing on the cake with another power play goal in the third and the Bisons prevailed by a final of 5-1. The Bisons enter the final weekend of the season still one point up on the Huskies. Two road games in Regina remain for the Bisons’ Canada West regular season.